Matema Jacobeth Malatji of Diopong Primary School, Leanne Bishop of Grantleigh College, and Khatija Osman from Durban Girls' College at the 2018 ISPA SuperTeacher of the Year Awards. The Internet Service Providers' Association (ISPA) has recognised teachers who use ICT to improve the educational environment in their classrooms, schools or communities. Through the long-running ISPA SuperTeacher of the Year Competition, Matema Jacobeth Malatji of Diopong Primary School was named ISPA SuperTeacher of the Year, Leanne Bishop of Grantleigh College was selected Tech Teacher for 2018, and Khatija Osman from Durban Girls' College was named Mobile Tech Teacher for 2018. The three were chosen from 10 finalists from public and private schools in rural and urban areas across the country. 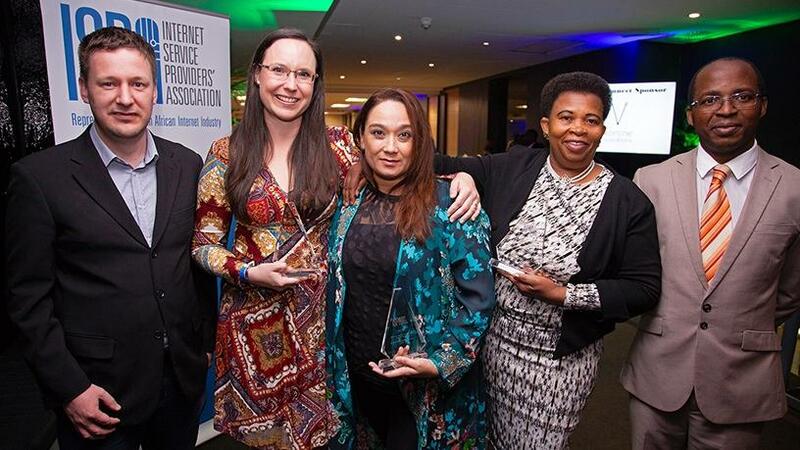 ISPA is the long-time sponsor of SA's longest-running national ICT in education awards, and the founder and co-host of iWeek, which took place in Cape Town last week. The Digital Education Institute, a non-profit education body, is ISPA's partner in the SuperTeacher competition and manages the association's teacher IT skills training programme that originally gave rise to the awards. Milford Malunga, project manager of the institute, comments that this year's finalists showed outstanding quality and originality in their projects. "The future bodes well for South Africa's learners if our country can continue to produce educators of the calibre of Matema, Leanne and Khatija." Basic education minister Angie Motshekga has issued a mandate to increase training in ICT for educators across the country and several companies have heeded the call. According to the department, less than 35% of SA's teachers had been trained in basic digital and ICT. ISPA's Train the Teacher project has to date equipped more than 5 000 teachers with ICT skills due to continued support from ISPA's members. "In the last three years alone, some 350 educators and district officials have been trained in different ICT courses," notes Malunga. Earlier this month, national organisation SchoolNet SA worked with teachers from 12 schools in KwaNdengezi, KwaZulu-Natal, to enhance their teaching skills through technology. The programme, which is part of a Microsoft Philanthropies YouthSpark project, saw 24 teachers spend two days learning basic computer science skills at Hillcrest High School to share with their learners. A 2017 study carried out by the French Development Agency, the Agence Universitaire de la Francophonie, Orange and Unesco showed ICT in education in general, and mobile learning in particular, offer a number of possible benefits. These include access to low-cost teaching resources, added value compared to traditional teaching and a complementary solution for teacher training.